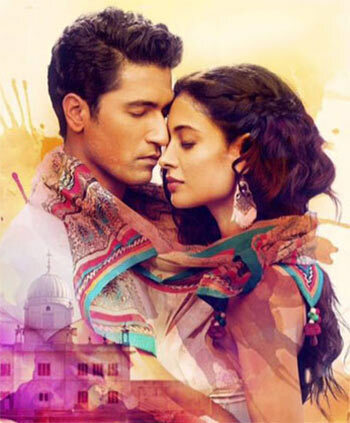 Zubaan emerges, sadly, like one of those ads where you can half-hum the song but you forget what it was for, feels Raja Sen.
Zubaan begins with a young Sikh boy, a very well-cast lad who looks like he’s itching to turn into Vicky Kaushal -- who we know from Masaan and have seen all over the posters for this new film -- as soon as he grows up. This growing up, alas, happens way too quickly, and we’re taken from a potentially fascinating and far more compelling backstory -- about a keertan singer who lost his ears and, thus, his tune, his reason to be -- into what is a well-meaning but feebly told story about that man’s son. This means a rushed prologue-style overdramatic musical score, alongside consistently expository all-clarifying dialogue, and this prologue hangover haunts the whole film. It hurts also that the overall narrative is painfully predictable: a young man unscrupulously goes up the corporate rungs to shadow a magnate he has long idolised. All the drama is drama we’ve seen before, like the hero taking the place at the businessman’s elbow, rendering the businessman’s son insecure... Yadda yadda yadda. Armed with a couple of fine actors, director Mozez Singh handles his first feature competently enough but could certainly have used a stronger script. This one stays entirely insipid through the first half and more, and then, as if overcompensating, hurriedly bungs in intense subplots towards the end. In a spell of 15 minutes, we have a monologue about a guy wanting to kill his own dog, a monologue about a dead brother, a revelation about a dying marriage and a so-called twist about the family dynamics delivered, tragically, by Kaushal with too much lipstick on, and there’s nothing quite as distracting as glossy pink lips on an earnest, square lead. There is also, clearly, too much focus on showing off the frills: the weird locations and the lanterns and the plumage hanging off a heroine’s dress. The heroine is obviously bohemian and free-spirited and, well, lithe -- and has nothing really to do with the story, per se. Kaushal’s character, Dilsher, is supposed to be handicapped by a stammer, but, while he is a fine enough performer, this speech defect never comes across as debilitating enough to get in the way of his life. More people mock his stammer than we actually see him stammering. The film, in a rush to tell its story with emotive punch, leaves many an unanswered question, questions as basic as what Dilsher has been hired as, and why his job description includes skulking around in cavernous clubs at night while bugs crawl up his shoulder. For a musical, surprisingly little attention is given to music performances themselves. The sound design plays well with the ideas of deafness and echoes and vacuum, but on screen we see mouths frequently out of sync with the song playing. There are amateurish montages of kids getting high, where the heroine takes entirely smokeless drags of a chillum, and singers who keep romantically improvising by cutting into each other’s songs without warning and getting it just right. The main song, Music Is My Art, sounds like an ad jingle, something used to sell you earphones or yoga-pants or a new data plan, and while catchy, is, thus, eminently forgettable. The whole film emerges, sadly, like one of those ads where you can half-hum the song but you forget what it was for. Look, Zubaan isn’t a bad film. It is decently made and reasonably well acted, especially by Manish Chaudhari who conquers the screen in his swaggering role of a boorish businessman. Kaushal is immensely earnest, and Raaghav Chanana brings some nuance to his part of the insecure son -- whenever the script allows him. Perhaps we ought to take a cue from the strikingly-haired French hip-hop dancers who pat the hero and heroine on their shoulders when they finally do kiss, and treat this boring little film with what it demands most: indulgence.